In the world of online product sales, this isn’t an issue. The price will be displayed on the Plans and Pricing page, usually with several (often three) options to choose from. What if you took the same approach with presenting the pricing for your services? It’s surprisingly effective in more ways than one. Today we’re chatting with Ilise Benun about one of her favorite topics, tiered pricing. You’ll not only eliminate uncomfortable haggling and gain confidence, you’ll also earn more on every client project with this approach. Brian Clark: It can be nerve-racking to negotiate your prices with a new client. Even simply presenting your pricing for the project can cause an uncomfortable squirm. 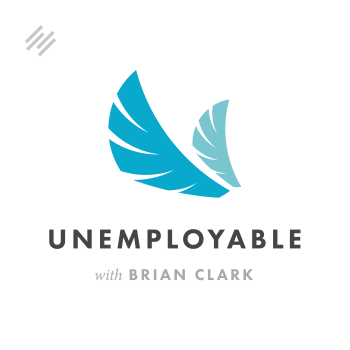 I’m Brian Clark, and this is Unemployable, solid professional advice for freelancers and solopreneurs. Thanks for tuning in. If you enjoy the show, please help out by leaving a quick rating or review over at Apple podcast. You can go directly there by visiting Unemployable.com/iTunes. Ilise Benun: I’m well, thank you. How are you today, Brian? Brian Clark: Pretty good, pretty good. I guess we saw each other back in October, was that right? Ilise Benun: Yep, at the AWAI. Brian Clark: That’s right. Okay. We chatted there and we probably got on the topic of pricing, which is your specialty. I mean, you help people in general, but that’s what stuck out to me about what you like to discuss in particular, tiered pricing and how it’s a very empowering strategy. Brian Clark: As we both know, it’s just difficult for people. There’s almost this innate hesitation or even fear to price what you’re worth or to raise your pricing, because you don’t want to lose the gig, especially if you’re struggling a bit. Yet it’s the worst thing you can do to just accept whatever comes along on someone else’s terms. Ilise Benun: Yeah, I think a lot of the stress with pricing comes from the fact that most people don’t really understand that it’s a conversation with a prospect as opposed to, “Here are my prices, take it or leave it.” So what I try to teach is how to enter into and have that conversation in a way that gets both parties what they need. Brian Clark: Yes, and it’s interesting to me, and I know this on the product side as well, how you present pricing information frames that conversation and can actually put you in a position of more confidence than you may actually have. That’s what’s cool about it, because it’s easy to say, “Just be confident, charge what you’re worth, blah, blah, blah.” That’s not so easy in practice. Brian Clark: Let’s first of all define what tiered pricing is and then we’ll get into some of the details of the strategy. Ilise Benun: I define tiered pricing simply as the situation where when a client asks you for a price, you give them instead two or three different options to choose from. Brian Clark: Okay. That’s interesting. Again, on the product side, three options in the SaaS world, hosting, things like that. It’s almost like an unwritten rule that you want to go by. It’s interesting. With the hosting side of things, our StudioPress sites, we had two plans and even though I’ve always known that three has this psychological effect on people where they tend to choose the middle price, and I know you say the same thing. What we found (and this is anecdotal, because it’s been too short a time), but sales across the board went up when we added a third plan. We can talk about this later in the context of a perceived value, but I think because we’re on the premium side of the hosting market, offering a third, more expensive plan actually made the first plan which is premium (it’s not shoddy or low cost or anything like that), it made even sales of that go up. How Does Presenting Three Pricing Plans Work on the Mind of the Customer? Brian Clark: Let’s talk about from your perspective, when you present, let’s say, three options for pricing with different plans, how that tends to work on the mind of the prospective customer. Ilise Benun: First of all, the idea is that you know what they need probably more than they do. That’s why when they come to you and say, “Can I have a price for X?” You may know that they need more than X or that more than X would be much more effective for them. When you position it that way, you basically position yourself as the leader in the conversation or the leader in your business, not someone who is basically just going to take an order and fulfill that order. I think just starting with that foundation is really important, because it creates confidence in you as the creative professional of positioning your services along with your prices. Brian Clark: Yeah. In the last episode of the year of Unemployable, we talked to Mike McDermott. He’s now the CEO of FreshBooks, the accounting software platform, sponsor of the show, got to throw that in there. But before he got there, he was a freelance designer. He shifted to value billing in order to work less and make more, so he could actually work on the software that he was developing. That’s really I think at the heart of what this concept is. Mike would come in at his full blown price, and when they objected — now sometimes they don’t object and that’s a win, because you know you’re charging what you’re worth. But when they objected, he didn’t haggle on price, he just started subtracting components of the package. Ilise Benun: Right. I think the interesting thing there too is that in the context of what I just said about you being the leader, at the same time, letting the client choose puts them in a position of control, because they’re also choosing from the different options that you give them. And as you say, yes, they may want to pay less and therefore, they understand that they’re going to get less, but they do usually want more and are often willing to pay for that value. How Does Tiered Pricing Affect the Business Owner? Brian Clark: You’ve made this argument that by offering the choices, that shifts you into (and I think this is a struggle for a lot of recent freelancers) moving from that employee mindset to a business owner mindset. You’re in charge, you’re presenting options, you’re providing choice, but you also created the parameters. You created the choices themselves, and that’s very empowering for people who may not have that inherent confidence yet. Ilise Benun: I don’t think the competence is inherent actually. I think it comes with practice. It comes with experience. It comes with competence. I recently actually came up with this idea that it comes from the uncertainty of not knowing what’s going to happen in any of these conversations, and yet knowing that you can probably arrange it so that you come to some kind of terms with your client if you stay in the conversation and try to find a solution for both parties. Brian Clark: Yeah, I think that’s right. And I think confidence builds when you see that people say yes, because you presented them with choices and it was up to them. But you also framed it in a way that made no less likely. Going back to my hosting analogy, I think the lowest plan went up in sales, because now that they saw what the next two levels were, they felt better about saying yes instead of no. They said, “Well, I can start here.” It’s a weird psychological frame and I’m fascinated by this stuff. But our perception of quality is basically based on how we price it, even if it’s the same thing that we could offer to someone else at a lower price. Ilise Benun: Yes. I think the other point that you’re making is an important one I want to highlight. When you give people options to choose from, it’s an entirely different conversation than if you give them one price and they either have to say yes or no to it. That psychologically, they’re choosing and therefore you are less stressed, because you’re not waiting for the no or the yes. There are options and it really just makes the conversation easier when you can subtract this or add that, and that is negotiating basically. In a way, I find that the package that you offer or the packages that you offer almost do the negotiating for you. Brian Clark: Yes, I think that’s what I was trying to say before, but you just said it much better. What does that do? Not only your business, but again, for your own sense of self-worth I guess, or if we want to put it in terms of confidence. I hear that over and over again. I think some people are insecure. Maybe they have imposter syndrome or maybe they just feel like they are not necessarily at the point where someone’s going to pay them at that level, I guess is what I’m trying to say. And yet, it’s all an exercise in how you present the information. Ilise Benun: I like to say it’s all an experiment, that every single one of these conversations is or should be an experiment. You’re actually reminding me of a client today, in fact, who I coached yesterday on a conversation that he had about a price with a brand new client. He said, “My gut feeling is that she’s not very well-experienced at this kind of conversation either.” So don’t assume the client is good at this or is comfortable talking about pricing and money, because most people do not like to talk about money. Brian Clark: That’s a good point. For example, anything I do outside of the main company where we have plenty of people to support whatever I want do, I have to enter into some sort of negotiation with a freelancer myself. If you present information in choice to me this way, it actually makes me feel more comfortable as well. That seems odd to say, because I’ve been doing this for over 20 years. But you’re right, you’re actually making the client feel more comfortable, which I think more often leads to a yes to you in some capacity. So he outlined in a lot of detail the talking points for essentially what she was going to get, and at the end of the conversation (that’s what he came back to me with today), she bought it at the price he originally proposed. Brian Clark: Mission accomplished. I think part of the problem is as creative people, it’s not really our thing to be into haggling over pricing or negotiating or any of that kind of stuff. And certainly not getting paid and handling the financial side of the business. Brian Clark: Going back to value pricing. They are paying for a solution, not your time, so quit selling your time. That’s not ultimately what they want. I think, as your illustration points out, clients think in terms of hourly rates with lawyers, accountants, designers, writers, and you just need to shift that and say, “No, you’re not paying for my time. You’re paying for a solution.” I wouldn’t be that necessarily blunt about it, but that’s exactly where you have to steer them back to. Ilise Benun: What you can say and what he did say is, “I don’t work hourly. I work by the project, and this is what this project is all about and what’s involved in it.” Because I think clients, especially when they ask for an hourly rate, yes, they may be used to it with some of the other vendors that they use, but they also don’t know any better. They don’t know what else to ask for. So I like to say, “Don’t give in to the premise of the question. Don’t accept the premise of the question, because they may not know what they’re asking for.” You need to give them something, but it’s not exactly what they’re asking for. Brian Clark: So it’s not only a conversation, it’s an educational process. Can You Address This Approach to Pricing from a Content Standpoint? Brian Clark: Can you work this approach to pricing into your marketing from a content standpoint? Do you feel that it helps to have an educated prospect before they even contact you? Ilise Benun: Absolutely. I think one of the best marketing tools that works in this way is case studies. Because in a case study, you go into a lot of detail about what’s involved. Then, when the client comes to you and says, “All right, what’s the price for X?” You can use your case studies to support why the price is as high as it is and as it should be. Brian Clark: Yeah, that makes a lot of sense. Just putting case studies out there, of course, social proof, credibility, authority, again, framing their perception of you before you even have the conversation makes the conversation really damn easy, relatively. Ilise Benun: Yeah, it qualifies people. That’s one of the beauties of getting better clients with bigger budgets means they’re qualified and you’re not wasting time on people who can’t afford you or don’t value what you have to offer. I like to use the word value as opposed to worth when people talk about what they’re worth, because that’s so subjective. The value to each client really depends on what they’re looking for and what their priorities are. So they may or may not value what you bring to the table, but it really has nothing to do with what you’re worth. Brian Clark: Yeah, that’s a great point. Okay, I think we’ve done a good job of explaining why we want to use tiered pricing. Now, can you give us some of your best, either high level or maybe just concrete steps to beginning the process of shifting perhaps from an hourly rate or a single project rate where you’re always worried they’re going to shoot you down or haggle with you. Ilise Benun: One of the things that is really important is being able to break down the services that you offer into pieces, so that you can mix and match them. I find people have a really hard time doing this, because they do what they do almost mindlessly, so naturally that they don’t see that, for example, the first conversation, in-depth conversation, that you have with a prospect is usually one of the most valuable to them and to you, especially if you end up going forward. And a lot of people give that away. They do a lot of strategizing. They do a lot of brainstorming and then they go back and put together a proposal, and if the client doesn’t buy the proposal, they’ve wasted all of those ideas. So I think it’s really important to identify the different steps in your process and which ones you’re going to give away for free as part of your marketing and qualifying process, and which ones are you going to hold for yourself and then be able to put into the different packages that you’re going to offer. Brian Clark: That is an excellent point. You’re basically saying, “Don’t lead with a proposal.” You hear all these stories of how agencies and freelancers will put a proposal out there and then see it basically stolen by someone else. How Does This Help in Moving Toward Scalability? Brian Clark: Yeah. That almost sounds like the same process where you’re taking a step back and you’re actually defining the parameters of what the service entails. If you do that beyond tier billing, I think you could actually set yourself up to grow. Do you see an intersection there between this as a first step to moving toward a more scalable agency if that’s what someone wants to do? Ilise Benun: Yes. I think I understand what you’re saying. Here’s my response, tell me if I’m wrong. Back to this client that I was talking about, because it was a big company who came to him and asked for a series of writing projects. But in order to do that, he had to create the plan, the communications plan first. So he basically said, “I’ll do the plan for you and here’s the price for it. Then, once I know what we’re doing, I’ll be able to price the deliverables and help you implement the plan.” And that will be a tiered pricing process or a couple of different packages that they can choose from. From that point of view, it is in this productized way, so that you’re not giving away the most intangible aspect of the work that you do, which I do believe is usually the most valuable. Brian Clark: Yeah. That’s actually another interim point in that process. I just think the whole process of taking a step back, which you’re saying is the first step, and understanding what you’re actually selling as opposed to what you’re using for marketing, giving away for free, is also a way to understand inherently the solution. Brian Clark: So you focus on selling the solution instead of yourself, if that makes sense. Right? Brian Clark: There are different approaches to this. There’s obviously the development of expertise, the rock star provider where your personal brand is very tied to it, and that’s great. That can even be turned into something else when you become more, perhaps a figurehead, where you’ve got other people who are working for you. So it’s not that you’re selling the solution at definite pricing. It just brought to mind that the first step in this is not just how to improve your pricing. If you improve your pricing in a tiered fashion, you’ve also set yourself up to go in more scalable directions as well. I guess this is Brian’s ambition. I’m always going, “Well, if you do this, then you can do this.” I mean, I can’t help it. And not everyone wants that. I think the starting point though is you have to understand the solution you’re selling and how to properly value that and communicate that to the client. Ilise Benun: Right, and one thing we haven’t mentioned yet, which I think is implied here, is that you can do this most effectively if you are focused on a particular niche or industry or specialty. Because then, you don’t reinvent the wheel every single time and you have your packages and you have your pricing tiers and it’s all very clear. I think that sounds like what you were referring to about the scaling process and then other people can actually implement the same packages. But it’s very difficult to do this if your work is all over the place and you have people asking for all different things. Brian Clark: No, you’re right. Some people push back against specializing, because they like the challenge of learning a new industry or whatnot. But the way things are today, you’re going to lose that project to someone who speaks the language, understands the pain points intimately of that particular person within this industry, this set of problems. I always encourage people to take this advice which is: become really, really good at serving a small amount of people as opposed to trying to serve anyone who walks through the door, because value goes way up easily and it’s easily communicated. Ilise Benun: Also, I think one of the misunderstandings when people think they’re supposed to specialize is that they think that’s all the work they’re ever going to do and it’s going to be really boring. The point I try to make is, “No, that’s the work you promote.” That’s what your marketing is based on. If other people come to you or you want to do other work, maybe even pro bono, to make it more interesting for you, to give you more variety, go, but don’t advertise it. Brian Clark: That’s true. Your marketing is laser focused. But just living life, people are going to come by and go, “Oh, you’re a designer, can you do this for me?” If you find interesting projects, then take them, but don’t solicit them, because you diminish your own expertise. Ilise Benun: Or don’t try to speak about your work in your marketing, in your content, as if you can do anything for everyone. People try not to alienate anyone, but you end up being really fuzzy so that no one can actually grab a hold of what you represent and what you can offer. Brian Clark: Yeah, I say it all the time — the most important component of modern marketing is exclusion. Who were you choosing not to talk to? Again, that’s another topic for another 50 podcasts, because people struggle with that too, but it’s so true. Ilise Benun: And it makes your marketing really easy, because you automatically know which events to go to and which not to go to, which website to offer to guest blog on. It just narrows everything down so that you don’t have to be worried, “Should I do this, should I do that?” And how are you spending your marketing budget? How Do You Best Communicate the Tiered Pricing? Brian Clark: So if we’re not going straight to a proposal that would include the tiered pricing, how do you advise to best communicate the tiers? I mean, is that a phone conversation? Is that a document that’s pre-proposal? What do you think? Ilise Benun: I’m not necessarily saying, “Don’t go straight to a proposal.” In this one situation I was talking about, he wasn’t ready to do that. And the client wasn’t ready for it. My main point though, that would be more general is: don’t jump to do a proposal just because someone asks. You have to have that conversation to qualify them, to figure out if what you offer is actually what they need and if they’re going to be a good client for you. And then, if they can get over that hump, if you can get them through that gate, then, yes, talk about what would be involved in a proposal. I think the part of the conversation that most people avoid is the money part, because until you know that they can afford you, you should not do a proposal. The trick that I use and advise people to use, and it works really well, is at a certain point, not too early, not too late in the conversation, you have to say, “All right, let’s talk about money.” You don’t ask for their budget, because they always say, “No, I don’t have it,” or “I don’t know.” Instead you say, “Are you thinking 500, 5,000 or 50,000?” You give them a wide, wide range and then they place themselves on that spectrum somewhere. So you at least know if they’re thinking 500 and you’re thinking 5,000, you should not do a proposal. Brian Clark: Yeah, that makes total sense. That’s good advice. Okay, if people want more from you on tiered pricing and the related intricacies, because there are always the little details that people get hung up on when they try to implement, where can they go? Ilise Benun: My website is marketing-mentor.com, and there’s an online shop where I sell this Tiered Pricing Kit, which walks you step-by-step through the process of creating these packages. Brian Clark: That sounds pretty good. We will put a link to that in the show notes to give you guys easy navigation. Ilise, thank you so much for coming on the show. I think our recent episodes on pricing have gone from general, “Charge more,” to “Each step,” a little more detailed on how you actually get that done. This has been really useful. Ilise Benun: Excellent. Thank you, Brian. Brian Clark: All right, Everyone, if you’re working with clients, 2018 is the year to make more and work less, or work more and make more, whatever, it’s up to you. Like I said, I have this ambitious streak. There’s nothing better than actually doing great work and being paid what you’re worth for it or the value that you provide, as Ilise said. So, keep that in mind. Thank you for listening, and keep going.